You must think there's a catch. Who wouldn't want today's stock recommendations from strategies that average gains of up to +63.3% per year? Yet, when I offered those picks to you for free, you didn't take them. So let me assure you here and now. This "Free Download" is really free. Clicking it won't commit you to do a thing or spend a cent! Since 2000, the S&P 500 has struggled through two recessions to eke out a tiny average yearly gain of only +5.1% per year. Big Money Zacks. Average gain +63.3% per year. Filtered Zacks Rank5. Average gain +57.4% per year. Momentum Method1. Average gain +31.7% per year. R² Growth. Average gain +18.8% per year. Why am I giving away these recommendations? I just feel it's the best way to promote our Zacks Research Wizard stock selection program. The latest stocks from our best strategies. A special report, Top 5 Valuation Secrets, to help you quickly pick your own winning stocks. The Research Wizard to try out for 2 weeks with no cost or obligation. The Research Wizard is a snap to use. Select from proven, profitable strategies that come loaded with the program. Or . . . enter your own favorite stock-picking criteria and narrow down over 8,800 stocks to a handful of the best ones. It just takes seconds. So please be my guest. Download the latest picks from our top strategies. And find your own winners, too. No obligation. It's all 100% free. "With the Wizard no benchmark stands a chance. If too many people discover it and start to use it, I'll lose a very valuable competitive edge." - Maurizio P.
1 The results for the companies listed above are not (or may not be) representative of the performance of all selections made by Zacks Investment Research's newsletter editors. *Past performance is no guarantee of future results. Inherent in any investment is the potential for loss. This material is being provided for informational purposes only and nothing herein constitutes investment, legal, accounting or tax advice, or a recommendation to buy, sell or hold a security. No recommendation or advice is being given as to whether any investment is suitable for a particular investor. It should not be assumed that any investments in securities, companies, sectors or markets identified and described were or will be profitable. All information is current as of the date of herein and is subject to change without notice. Any views or opinions expressed may not reflect those of the firm as a whole. Zacks Investment Research is not a licensed securities dealer, broker or US investment adviser or investment bank. The Zacks #1 Rank Performance covers a period beginning on January 1, 1988 through December 31, 2017. These returns are from hypothetical portfolios consisting of stocks with Zacks Rank # 1 that were rebalanced monthly (see additional details regarding rebalancing below) with zero transaction costs. These are not the returns of actual portfolios of stocks. Zacks Rank #1 stock-rating system returns are computed monthly based on the beginning of the month and end of the month Zacks Rank #1 stock prices plus any dividends received during that particular month. 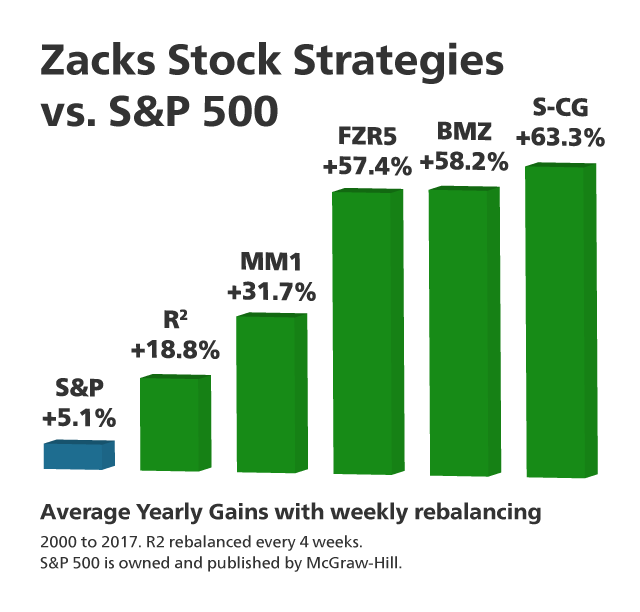 A simple, equally-weighted average return of all Zacks Rank #1 stocks is calculated to determine the monthly return. The monthly returns are then compounded to arrive at the annual return. Only Zacks Rank #1 stocks included in Zacks hypothetical portfolios at the beginning of each month are included in the return calculations. Zack Rank #1 stocks can, and often do, change throughout the month. Certain Zacks Rank #1 stocks for which no month-end price was available, pricing information was not collected, or for certain other reasons have been excluded from these return calculations. The S&P 500 is an unmanaged index. Visit https://www.zacks.com/performance for information about the performance numbers displayed above.